• Review implementation progress of the Hyogo Framework for Action in Asia and review challenges and priorities for the coming year. The National Emergency Management Agency of the Republic of Korea, hosts of the 4th AMCDRR, discussed preparations for the upcoming conference. In the same session, the National Security Council of Malaysia reviewed a key output from the the 3rd AMCDRR, the Kuala Lumpur Regional Action Plan to implement the Kuala Lumpur Declaration. 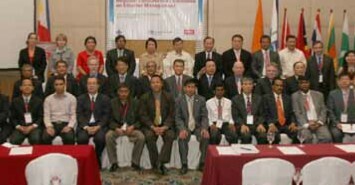 The HFA implementation status in 2005 and the progress made up to 2007 was showcased along with the HFA implementation in Asia, the Global Assessment Report and the ISDR Asia Partnership Initiative on regional stocktaking and mapping of DRR interventions in Asia and the Pacific. The session also elaborated on UN-ISDR global campaigns on safe schools, hospitals and the upcoming global campaign on building resilient cities. ADPC presented activities to be implemented under the global campaign on building safe resilient cities which addresses urban risk. During the meeting, the discussions from RCC7 were revisited in addition to the working paper developed by the RCC on ‘implementing national programs on CBDRR in high-risk communities,’ which is based on the CBDRR country papers submitted during RCC7. In the session, the Governments of India, Philippines and Viet Nam presented their experiences on implementing national programs on CBDRR followed by group discussions on the components of the RCC working paper on national CBDRR programs and corresponding presentations. This session concluded with a panel discussion on support by partners and donors in implementing national programs on CBDRR. The main outcome of RCC8 was the adoption of the Manila RCC8 Statement on ‘Implementing national programs on CBDRR in high-risk communities.’ Similarly, the objective to share experiences of linking community level actions on DRR and CCA was also attained, which led to key outcomes, such as initiating discussions on community resilience to climate risks, looked at ways to build resilience to current disasters and future climate change scenario and assured greater linkage and synergy between action plans on CCA and DRR.